Kit out your kitchen with our gorgeous real wood floating shelving. This ash floating shelf is complete with a distinctive and appealing natural grain pattern, and comes pre-drilled and supplied with the necessary support to create the magnificent floating effect. This ash shelf has been carefully crafted by a skilled team of solid wood specialists, using the latest manufacturing methods to ensure maximum precision and a pristine finish. Once cut-to-size, our wooden shelves are carefully sanded and coated in a protective oil, to preserve and enrich the timber's natural lustre. Measuring 300mm X 200mm X 40mm, our floating solid ash shelf comes with a chunky square edge profile, which enhances the contemporary look. These shelves are made with the same methods as our solid ash worktops: each one has been meticulously assembled from finger-jointed wood staves, which are bonded together under high pressure. 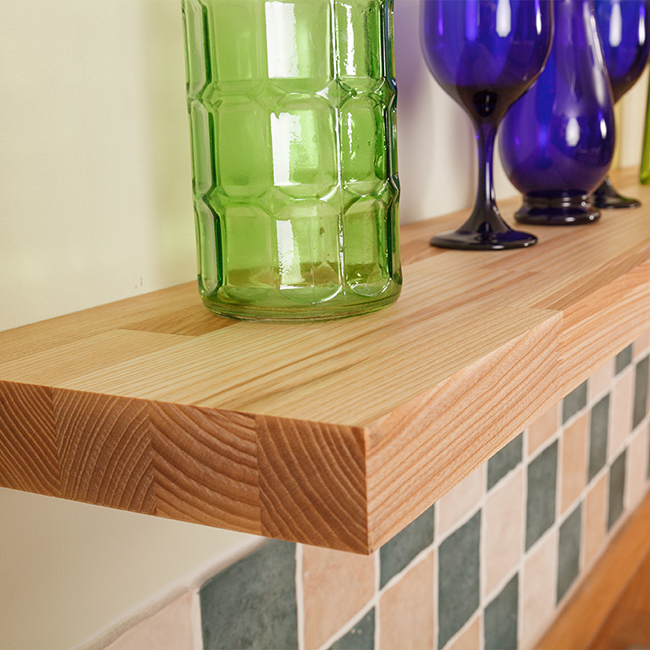 This ash shelf comes with a two floating shelf brackets, which provide plenty of support. We recommend fixing shelf brackets to a solid brick or stone wall; if you would prefer to mount it onto a stud partition wall, we strongly advise fixing the brackets directly into the studs. Made entirely from real wood, these shelves showcase some stunning natural features, including small knots or splits that truly enhance the innate natural beauty of the timber.